Long, long ago, before our ancestors had either sheep or horses, they had various domestic animals, including turkeys. 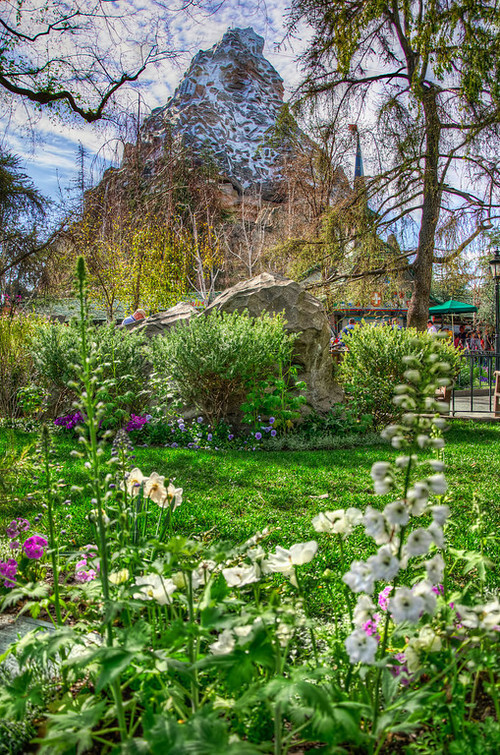 In Matsaki, or the Salt City, there were many wealthy families who owned turkeys, and the slaves and poor people would herd them about. There lived a very poor girl, who was pretty of face but her clothes were tattered and dirty. But like other poor people, she was humble and kind, and as she herded her turkeys about, she would speak kindly to them. They loved their mistress and were very obedient to her. One day, as the poor girl drove her turkeys into the plains, she heard the priest proclaiming from the house-top that the Dance of the Sacred Bird would take place in four days. Since this girl was so poor, she had never been permitted to join or watch any of the great festivals, and longed to go. But she knew that, dressed as she was, she would never be able to go. She continued to drive on her turkeys, as she talked to them, never dreaming that they had any idea what she was saying. Each day as the girl drove her turkeys out, she saw the other villagers preparing their garments and cooking and getting ready for the festival. On the fourth day, after the other people had all departed for the festival, one of the big turkeys strutted up to her, spread out his tail and wings, and said, "Maiden mother, we know what your thoughts are, and truly we pity you, and wish that...you might enjoy this holiday." He went on to say that they would help to dress her up prettily, so that all the young men would long to dance with her. The girl was surprised, but it seemed so natural that her turkeys should be talking to her. She expressed joy that they could talk to each other, but asked how the turkeys could talk of things that were impossible. 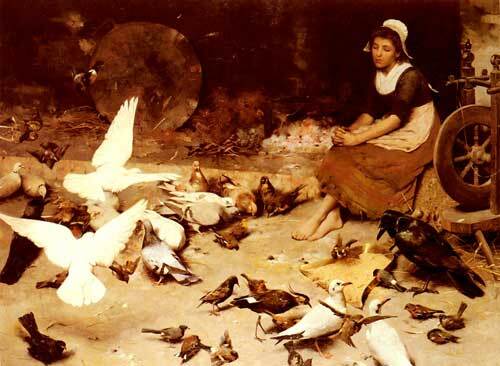 The turkeys assured her that, being humble, she deserved the happiness of going to the dance, but if she should forget her turkeys, it would prove that she deserved her hard life, because without her poverty she would be as unkind as the rich people were to her. She assured them she would be obedient to them as they were to her. The turkeys instructed her to give them her articles of clothing, and as she did, one of them would come forward and step on it and peck at it, until it was transformed into beautiful clothes like those the people of the village wore. They also gave her jewelry and ornaments they had colleted for her. Looking beautiful, the turkeys told her to go, but warned her to leave the wicket open in case she should forget about them, they could leave. She assured them she would remember them, and went to the festival. The people all wondered where the beautiful maiden came from, and she was not without a dancing partner. But in her enjoyment she did not think of her turkeys, but only wondered how she could leave such a place to go back to her turkeys, so she stayed until the dance was nearly over. Only then did she run back, but her turkeys had already left. She returned to the fold and found it empty. She went out in search of her turkeys, calling them, but her clothes returned to her former rags and she remained poor. *This story is in a collection of Native American folktales, in the section "Tales Borrowed from Europeans"-so don't think that this story happened to originate independantly of our Cinderella with all of its parallels. 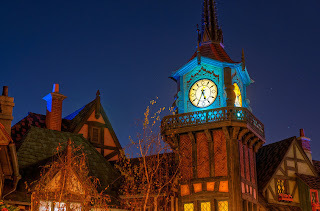 To the Perrault/Disney-weaned fairy tale fan, this may not seem to have much connection with Cinderella without the evil stepsisters or fairy godmother, but the animal helper is very common among Cinderella variants as her source of beautiful clothes. What makes this tale so unusual is the non-traditional unhappy ending. I don't like the hint that all poor people deserve to be poor, although it's a good reminder not to let wealth and priviledge curb your compassion-but after reading so many other Cinderella stories I find the ending kind of humorous. A young man went out from his mother's house to go out into the world. On his way he passed an old woman carrying a heavy jar, and offered to carry it for her. In gratitude, the woman fed him and gave him her dog and cat as companions, and a ring, which she promised would grant him wishes. Gigi didn't think much of the ring itself, and didn't want to rob the poor old woman, but she insisted, so he took the ring and the animals and went on his way. Later on, Gigi was hungry. He happened to be playing with the ring in his pocket and thinking, "I wish a table could be set before me now, with a fine supper on it," when all of a sudden it appeared. Gigi and his animals ate a full meal, and Gigi thought of all the other things he could wish for-but stopped himself, not wanting to lose his head over his good luck, and fell asleep. In the morning he thought of wishing for horses, but laughed and decided to continue walking. 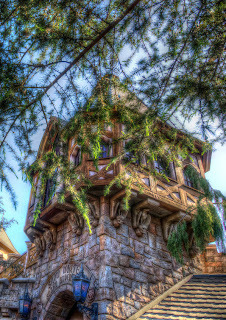 On his way he passed a home with a beautiful maiden looking out of the upper window. He decided to use his ring to wish for a fine home to be built across from hers. He was able to get to know the maiden, Maliarda, and her parents, and by the end of the first day Gigi and Maliarda were engaged. However, the eve before the wedding day, Maliarda asked him how his house had sprung up so suddenly, and, being trusting, Gigi told her the truth. Maliarda told her mother, who advised her daughter to slip a sleeping potion into Gigi's drink, and take the ring from his finger. She did this, and put the ring on, and wished that Gigi's palace would be moved to the highest, steepest, snowiest peak of the mountain range. Gigi woke up cold, and was perplexed as to why he was on the top of a mountain, but knew it didn't matter as long as he had his ring. It was only when he discovered his ring was missing he suspected the beautiful Maliarda to be a traitor. Gigi's dog and cat made the trek down the mountain to gain his ring back for him. The door to Maliarda's room was closed, with a hole too small for either of them to get through. The cat caught a mouse and promised to release him if he would first gnaw the hole larger. 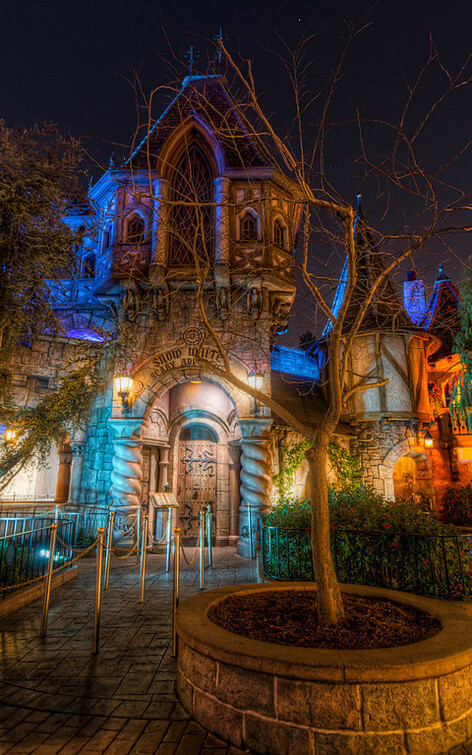 The mouse gnawed until all his teeth were broken, but the hole wasn't large enough for even him to go through. So the mouse's littlest child went in through the small hole, bit Maliarda's finger in her sleep so she took off the ring without waking, and brought it back. 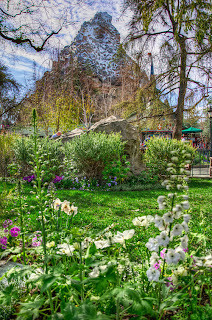 The cat and dog went back to the palace on the mountain, but quarreled along the way as to whose credit it was that they had retrieved the ring. As they quarreled, the ring fell into the river and a fish snapped at it. The dog jumped it and got the ring from the fish's mouth. 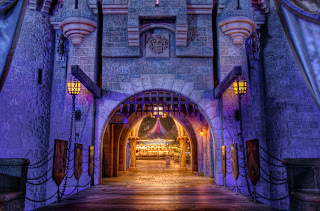 Gigi assured them that they were both equally loved, and he wished his palace and Maliarda's to switch places. After a few days Gigi felt sorry, and wished them halfway down the mountain, where they could reach safety, but their useless mansion was left at the top. "Is the ring still in the wedding-chest? Does Gigi ever take it out, put it on his finger and wish? I do not know. When I have passed his way I have seen him ploughing with a fine team of fat oxen, and singing the while, or in the woods with his good friends the cat and dog, for they are still alive and hearty. He has not yet gone back to live in a palace; but all the neighbors envy his mother and her good son Gigi." 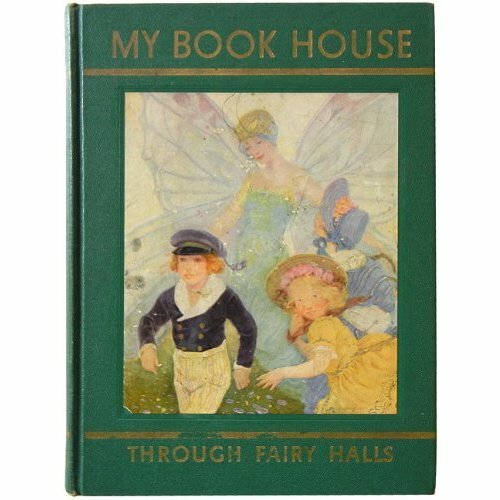 *Story by Anne Macdonell, found in My Bookhouse Through Fairy Halls. "The movie is brought to you by the letter F.
F for Fairytale. F for Feeble. It is meant to be a comedic retelling of the traditional story. But sadly it is far from funny. It's neither fish nor fowl. It tries to be knowing and dry but falls way short of that." I STILL have not seen Mirror Mirror yet and therefore can't chip in my two cents...although I adore Netflix and get more than my money's worth out of Instant Play, I'm pretty terrible when it comes to the dvds by mail-I think my current dvd I've had since March...I know, shameful. 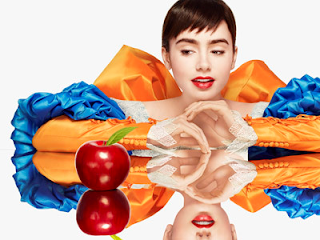 Although since I wrote that I felt guilty and got out that dvd to mail back and put Mirror Mirror on the top of my queue. Noticed Netflix describes it as "much darker than the well-known animated Disney version." Which makes me wonder...when's the last time they've seen the Disney version? As Disney movies go, it's pretty dark, that witch is creepy--and from the previews this colorful family-friendly version doesn't seem to be especially dark to me. 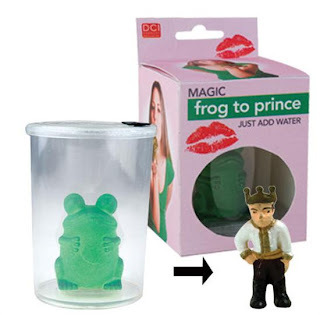 Your Own Magic Prince-Just Add Water! "In life, you have to kiss a lot of frogs to find your Prince Charming. Forget the internet dating game, despair no more with the Magic Frog to Prince Kit. It’s easy, simply submerge the little frog into water, and in a little while, the Prince you’ve been looking for will appear. It’s that simple. No mess, no fuss. Instant Prince, enough said. " Hope it made you laugh too! Thanks to Jill for the link! "In fairy tales the primary task for women is bearing children, and childbearing was often fatal; whatever other power women had lay in youth and beauty." So says Roger Sale in Fairy Tales and After. Indeed, many fairy tales begin with the wish of bearing a child-Snow White, Rapunzel, Sleeping Beauty, The Juniper Tree, and the Russian tale Kip, the Enchanted Cat. 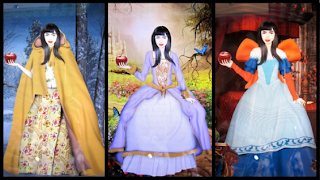 And nearly every fairy tale in some way illustrates a woman's desire to be beautiful, if nothing else than featuring a protagonist who is not only beautiful, but usually the most beautiful. 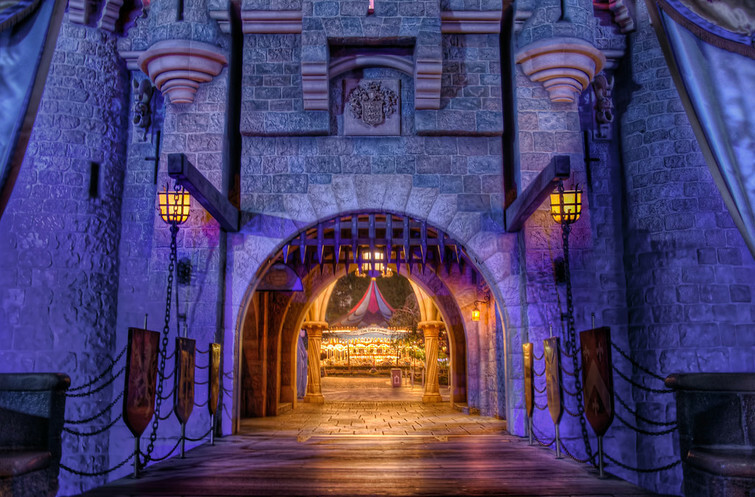 But nowhere is this desire more clearly seen as a powerful driving force than the Queen in Snow White. And if anyone thinks that feminism has made this kind of envy a non-issue I would have to strongly disagree with them; the desire to be beautiful is still a very real part of modern life. However, I think that we have as a society moved beyond the point of only finding value in a woman for her ability to attract a mate, then bear and raise children. What about men in fairy tales? Sale's words (emphasis mine): "Older men in fairy tales usually are dutiful, stolid people, restricted to work, food, and small pleasures. But because their power was not primarily a sexual power, men in fairy tales seldom develop an envious murderous passion against younger men, because whatever power men have does not erode with time." 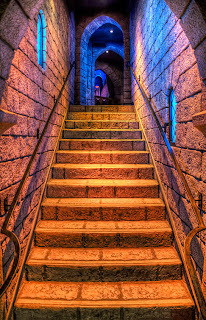 Sale was discussing Snow White here: as many have noted, and what I think makes Snow White one of the most haunting tales of all, is the fact that Snow White is basically destined to become the Queen one day, or as Sale says, she and the Queen "are the same person at two different stages of life." I wonder if, as a culture, we still see women's power as primarily being sexual, despite the progress we've made and the addition of powers she has. You don't have to watch t.v. for very long to see a woman being objectified in some way. Every woman battles with cultural pressures as well as her own instincts; even the strongest occasionally struggle with self-doubt, largely coming from fears of how she is being perceived. I don't have any particular conclusions to draw from all this, just some food for thought. 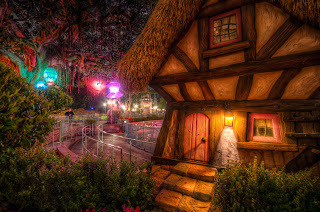 But one thing I think is very interesting, and would definitely influence how we draw conclusions from gender roles in fairy tales-in Bengt Holbek's essay "Hans Christian Andersen's Use of Folktales," he discusses a study he did collecting folktales in Denmark, and the differences he found between those told by men and women. "Men very consistently preferred tales with male protagonists, whereas woman gave approximately equal attention to tales with male and female protagonists." I almost wonder if males are somehow more universally understood. A male friend of mine who is a writer once told me he found girls hard to write, but I don't know if girls would find boy characters hard to write (but I don't really write fiction, so feel free to correct me). I always found it just as easy to identify with a male protagonist as a female one, but do men struggle to fully relate to a female character? You may or may not be as into Disneyland as I am, but you will probably appreciate the photography of Tours Departing Daily, a blog that features pictures of Disneyland that would probably make most adults who have been there do a double take and think, "Wait, is that actually the same Disneyland I went to?" 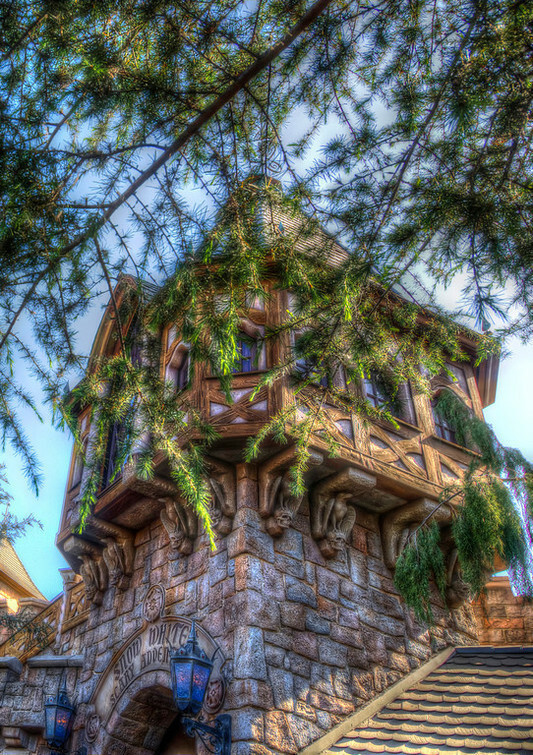 I've never considered Rumpelstiltskin to be among my top favorite fairy tales, and there isn't all that much written about it compared to other fairy tales. But it seems to be the kind of story that, the more I think about it, the more mysterious I realize it is, and therefore I have a growing attachment to it. It was Marilyn Singer's poem in Mirror, Mirror (if you missed the hype the first time around...yes it's for young children but I HIGHLY RECOMMEND IT. 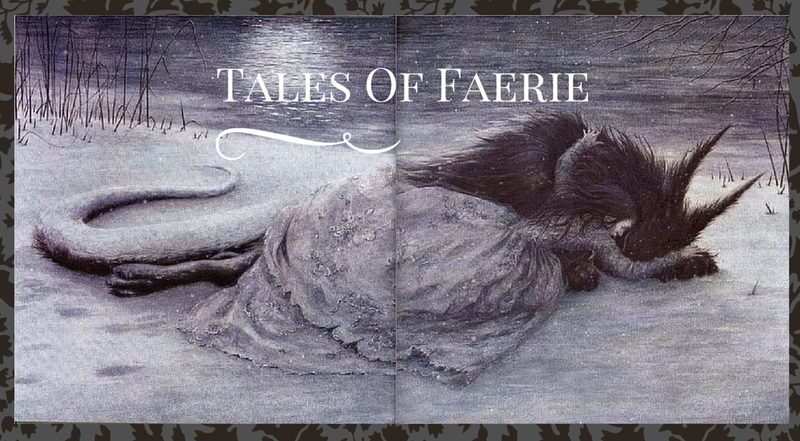 Clever and thought-provoking reversible poetry on fairy tale themes. 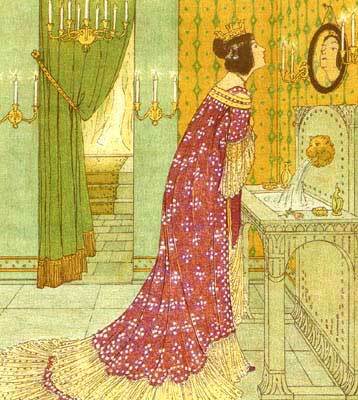 I think I cry a little each time I read the Beauty and the Beast one...) that first made me realize that, though the whole happy ending is brought about by the Queen's naming of Rumpelstiltskin, she herself is never named. It seems sad to me that this character is lost in anonymity, yet if she gains power over Rumpelstiltskin after learning his name, maybe she somehow retains a certain amount of power over us, for none of us can ever name her (more thoughts on the power of a name in this fairy tale here). 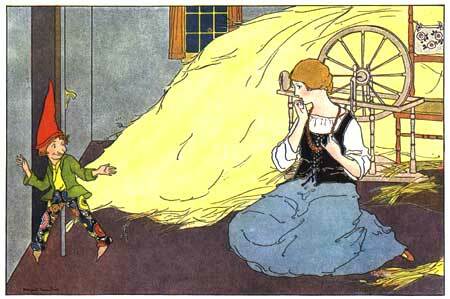 Though Rumpelstiltskin is supposedly the villain, he is actually the least evil of the male characters. 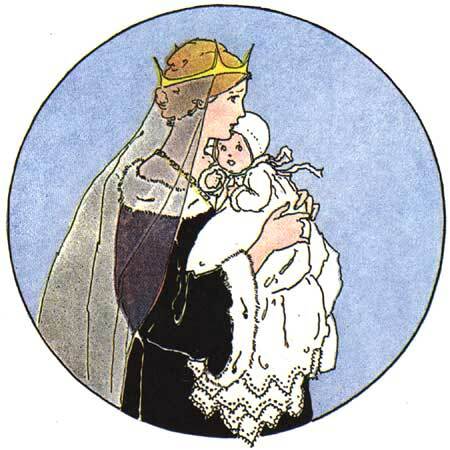 In the words of Roger Sale, "It is not the miller who boastingly vaunts his daughter into peril, or the avaricious, cruel king who marries her, but the little man who helps her and wants only a child for himself who is singled out for punishment." The reason is never given for Rumpelstiltskin's desire for a child-although desiring children is a very prominent theme in fairy tales, although ususally it's women wanting children, and usually their own (with the exeption of the witch in Rapunzel, also a figure who is more sympathetic in some variants.) 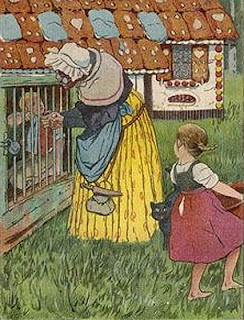 But even in the Grimms' version, Rumpelstiltskin "feels sorry for" the Queen, and instead of demanding the child which was really his, according to the promise the Queen herself made (although the conditions under which the promise were made were not exactly fair...), he creates a loophole: allowing her the ability to guess his name over three days. 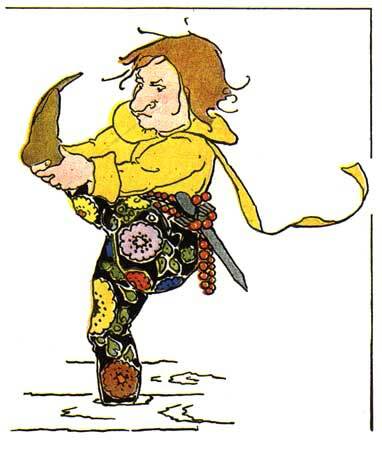 But according to Heidi Anne Heiner's notes on the Surlalune page, the last episode, in which Rumpelstilskin tears himself in two and is swallowed into the ground and therefore seems more evil and ridiculous, was actually an addition by the Grimms-originally the little man flew out of the window on a cooking ladle. Pictures can also go a long way in changing how characters are perceived, as these illustrations by Margaret Evans Price show. So this man, who has at times been called a demon or dwarf, is never defined as anything other than being a little man. But where do his magical powers come from? 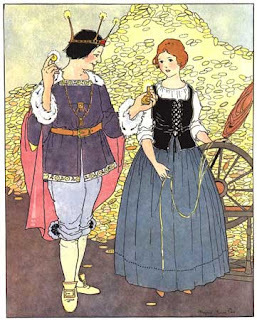 Why does he ask for the heroine's most prized posessions initially when he clearly has the ability to make valuable things for himself (he initally takes a necklace and a ring, only asking for the child when the woman has nothing left to give)? Why does he want the child? Why does he pity the Queen at all? It is this abundance of unanswered questions that make the tale so fascinating and so open to various explorations and interpretations. Below is an excerpt from a Politically Correct Little Red Riding Hood, which is not the version by James Finn Garner found in Politically Correct Bedtime Stories (although Red's initial remark to the wolf is nearly word for word identical to Garner's...but the rest is unique). Red Riding Hood returned to the main path, and proceeded towards her Grandmother's house.But because his status outside society had freed him from slavish adherence to linear, Western-style thought, the Wolf knew of a quicker route to Grandma's house. Red Riding Hood entered the cottage and said,"Grandma, I have brought you some cruelty free snacks to salute you in your role of wise and nurturing matriarch." 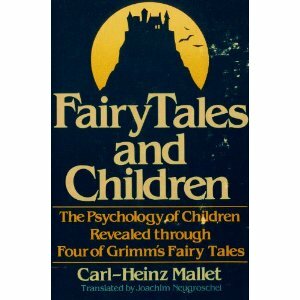 In his 1984 book Fairy Tales and Children, Carl-Heinz Mallet spends 48 pages explaining his interpretation of Hansel and Gretel (I tried to sum it up without being too long-winded...) He has some very interesting points, although sometimes he tends to either contradict himself or get too caught up in the details according to his own interpretation. 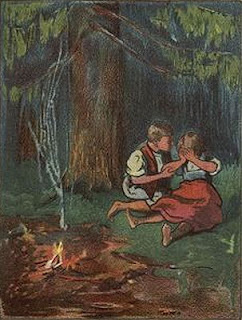 Mallet begins by defending the parents' decision to leave their children in the woods. He points out that the narration of the story never calls either parent good or bad, those judgements are assumed by the reader. This is true and also characterizes fairy tales in general-if there is any moral lesson it was inserted by a literary author and not an original part of the tale. Yet Mallet claims that the mother/stepmother is not cruel at all, simply logical, for the reasons given in the story-they are starving, and not everyone can survive. Yet, since when are cruelty and logic opposites? Oftentimes they go hand in hand. You can have a calculating and cold-blooded killer. To abondon your own children in the forest so that you can survive a little longer is simply wrong. Yet, Mallet points out a very interesting fact: not only did the Grimms change the mother of the original story to a stepmother, but they villainized her even more. In the Grimms' notes, when the mother wakes the children to lead them into the forest, she says, "Get up, children, we are going to the forest. Here is a piece of bread for each of you. Be careful with it and save it for lunch." But the wife that appears in their collection says, "Get up, you lazybones," and gives them bread, saying, "this is all you are getting." One feels from this description that maybe the first mother really wasn't quite so cruel-she possibly suffered from watching her children go hungry and couldn't bear it any longer (although abandonment is still not the ideal solution). Mallet points out that the parents' roles are reversed from traditional genders-the mother is the logical one who demands action and does not react with feelings and emotion; the father comes across as someone who is weak and emotional but unable to stand up for himself. In this tale we have an example of people who are "human and natural" and don't fit perfectly into stereotypes. He says, "this fairy tale pulls both figures off their unsuitable pedestals and brings them down to earth." Sure-humans are flawed and we don't always conform to gender stereotypes, I totally buy that. But to say that the mother is "in no way cruel or hard-hearted" would make me very concerned for Mallet's own children, if he had any. And yet Mallet cannot be so unfeeling as his words would indicate-in the forward he describes how he came to be interested in what fairy tales reveal about children in the first place. He was volunteering as a teacher in a school in a German refugee camp in 1947 for a class of unruly children he couldn't control. He went to his uncle, a psychologist, for advice about dealing with children. His uncle pulled down a copy of Grimm's Fairy Tales, handed it to him, and said, "This book contains everything that anyone can know about children." Mallet goes on to share that when he read fairy tales to the class, they were quieter and more calm than during any other activity. This is a very interesting story, and as much as I love the Grimms' Fairy Tales I don't know that I totally agree with his uncle's statement-but teaching in an impovrished refugee camp is certainly not a very logical and self-serving thing to do, it is compassionate and unselfish and admirable. Which makes the next section all the more confusing as well. In Mallet's eyes, the bread is not literal bread, it is love. He claims that since the family still has a house and other posessions they cannot really be starving, but I don't see how that logically follows. But in his view the bread is love, and this tale represents the fact that, when children are born, they take away the parents' focus from loving each other to loving the children. This is true, but again, some of his words on the topic get kind of disturbing-the mother in the story "realizes that the couple, the mutual love of the parents, constitutes the basic relationship in the family and must be preserved. This relationship is primary; being a mother or father is secondary...this is the prerequisite for a happy family life." Um...I have no personal experience being a mother, although I have done quite extensive nannying/babysitting as well as my teaching. Obviously parents need some time to take a break and focus on themselves, but if you're not aware of the immense sacrifice that it takes to raise children and not willing to let them be the new focus of your life, you should not be raising children. Period. 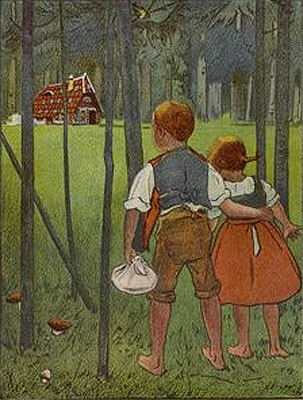 Hansel and Gretel themselves are characters children can latch on to and look up to. They are clever and find out what their parents are up to, react with amazing calmness, and take action to attempt to save themselves. 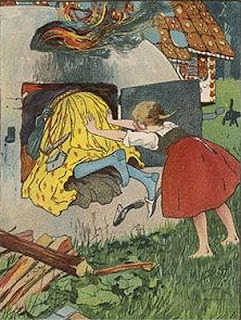 Mallet says that the strength in Hansel and Gretel's reaction to the situation can put a fearful child at ease, which I agree with, but adds, "especially one who fears that when his mother leaves, she will never come back." Um...who in their right minds would think that this story would comfort a child who fears his mother will never come back?? This story says, "not only will your mother never come back, she'll take you to the middle of the woods and leave you there!" The reason it's empowering is not because the children put their trust in their parents, but because they learn to be dependant on themselves. Which is appealing in a way but also terrifying in real life. Like Bruno Bettelheim, Mallet manages to see the children in this horrible predicament and yet accuse them of being selfish. Bettelheim sees their devouring of a candy house as their indulging in their oral fixations; Mallet repeatedly calls them "egocentrics" who don't appreciate the fact that the woods provides all of their needs (berries...) and the fact that they wander around and don't make shelter for themselves or have a long term plan (as children, mind you) indicates how they are reverting back to infant-like states. And then of course, they willfully destroy someone's property without a second thought-breaking window panes and pieces of the roof off. Except that, if your house is made out of candy, you shouldn't be surprised if someone tries to eat it. Which is exactly what the witch planned on. Also, if you actually take the story at face value, the children were starving to begin with, and have now been wandering around the forest with nothing to eat but a few berries for three days. Heck-I'd probably break into someone's house under those circumstances. The witch initially offers the children what must have seemed like paradise-a delicious dinner of sweets, no commands to do chores, no scolding, and fresh beds. Mallet says that children will initially long for a mother like this, but realize when her real purposes are unveiled that they're probably better off with their own mothers. Hansel's imprisonment, he says, is actually his own wish fulfillment-he wanted to be taken care of like an infant, and now is penned in and will be symbolically devoured by the mother figure who will never let him fully develop independance. 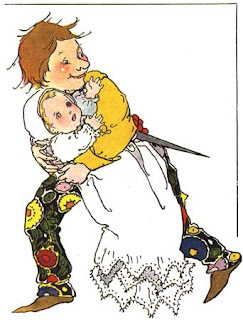 Mallet goes on to say that the way the witch treats Hansel and Gretel reflects, in an exaggerated way, the difference between how mothers treat sons and daughters-coddling the boys and being harsher on the daughters. Now I'm not a psychologist, and I can only speak from my own experience, but this is not true at all in my family-both my parents loved myself and my siblings equally. Even looking back in retrospect I can't see that our gender had anything to do with how we were parented. And then of course Gretel ends up being the one to save the day, which Mallet sees as being this huge upset of traditional expectations of girls-which it is, I guess, but that's kind of old news these days. And when reading enough variations of fairy tales, there are variations where genders are reversed, so you learn not to read too closely into what each gender's actions represents about their gender. 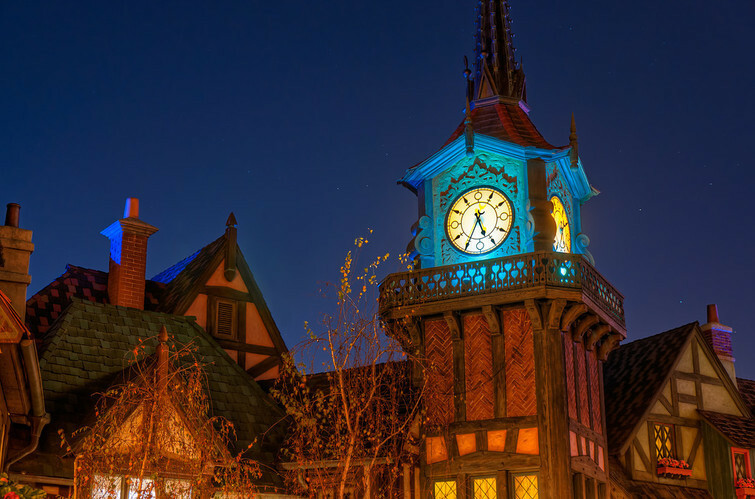 "Many people seem to think that this story of Andersen’s is deeply anti-feminist. I think that is a profound misreading. I’m not arguing that he was a feminist in our terms or that he was anything other than a man of his time. But it astonishes me that such people haven’t noticed that he has identified himself completely with his female hero — she’s not the Other (as women continue to be for so many male authors), she is himself. Furthermore, she is doing something completely atypical of traditional fairy tale heroines (or at least those belonging to the canon of the best known) — she is the lover, not the beloved, the active, not the passive one. Indeed, it is she who saves the prince from drowning in a feat that would take almost impossible strength and stamina, even for a mermaid. She’s only a fifteen-year-old girl with a fishtail, after all, and yet she holds the insensible prince above the waves during the entirety of a terrible storm at sea, which has wrecked his ship, and which rages all night. Then, as the story develops, she pursues him — but, lacking the voice she has given in payment to the Sea Witch for the magic that will split her fishtail into legs (and less obviously but just as importantly, being a foundling with no family or earthly breeding) — she is unable to win his love. 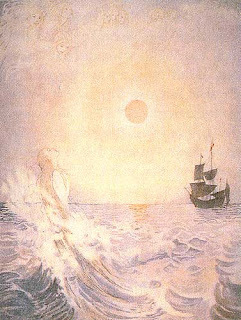 (And incidentally, what an unforgettable character the Sea Witch is — laughing in scorn at romantic love, and cutting, with the Little Mermaid, one of the most chilling devil’s bargains in literature. And the Little Mermaid’s grandmother — what a marvelous creation! — with all her wise counsel against reaching too high, and being discontent with what she believes to be the pretty good wicket of mermaid-hood.) 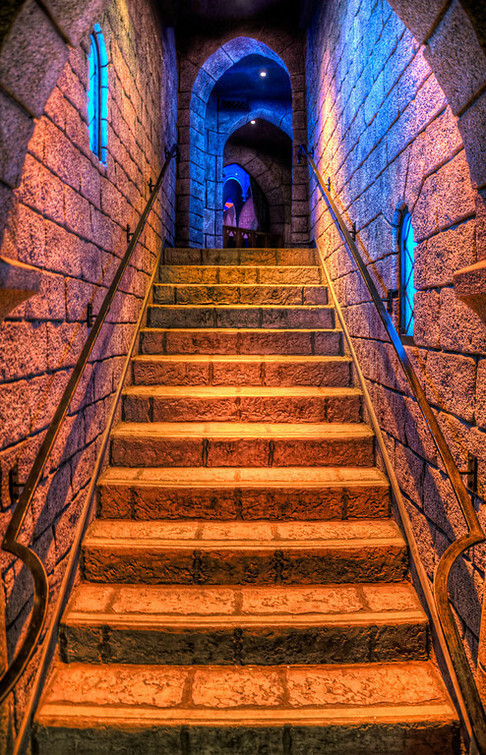 It is also crucial to note, not only that the Little Mermaid makes her own independent choices, creates her own destiny, throughout the story, but also that in the overwhelmingly powerful denouement, which is to some extent a twist, the Little Mermaid beats the Sea Witch and even the strictures of the story itself, at their own game. Two possible endings have been laid out for her by others; instead — by staying utterly true to her self, her principles and her conception of genuine love — she invents her own." Tonight in Chicago the Grant Park Symphony Orchestra played Rimsky-Korsakov's "Scheherezade." The imposing opening theme is the Sultan, answered by Scheherezade, represented by the solo violin, who weaves the movements together as the narrative voice. 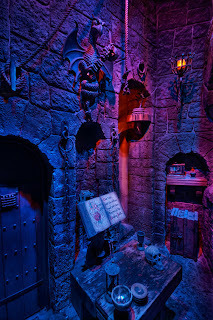 In the first movement, The Sea and Sinbad's Ship, listen for the strings with their slow arpeggios, the undulating swells that accompany the movement are like waves.